Lumiere sent out a clear warning message to her potential rivals in next year's Qipco 1000 Guineas after emerging victorious at Newmarket. In what was one of the most anticipated two-year-old clashes of the season, the highly-regarded daughter of Shamardal displayed the qualities she showed during her scintillating maiden victory at Newmarket's July Festival when landing the Group One prize. Sharply away from the stalls, the Mark Johnston-trained filly was soon in command with William Buick happy to let her stride out in front to ensure there was no false pace. Winding matters up from the head of the field, Buick soon had many of his rivals, including favourite Besharah, under pressure as he opened up a near three-length advantage shortly after halfway. 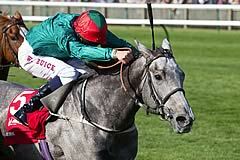 Although the strong-travelling Illuminate loomed up as a serious danger late on in the hands of Frankie Dettori, the pair could not quite master the long-time leader as Lumiere continued to find plenty to hold off the Richard Hannon filly by half a length. Lowther Stakes winner Besharah was a further head back in third. Lumiere was cut to 8-1 by both Paddy Power and William Hill to give Johnston a first Guineas winner since Attraction back in 2004, with Coral going 12-1 and Ladbrokes 14-1. Johnston said: "I was pretty sure she was very good, but you don't know what they are beating at home and she'd done it so easily. "I was not as disappointed as you might think in the Lowther. You couldn't ask more of a horse. The winner (Besharah) swept past her and she was very inexperienced. She'd not seen another horse before in a race and she did stick on. "Coming here today, I hadn't been as nervous before a race for a long time, because I thought she's the best horse I've had for a long time. "I hoped she was probably the best horse in the race, but I wasn't sure if she had the experience or the condition for it. She had gone in her coat. I've only got four horses like that and she's one of them. "She was probably the tallest and rangiest horse in the race today and we always thought there should be no shortage of stamina and we also know she is very fast and has a tremendous cruising speed. She is not keen, just very fast. "I'm very hopeful she'll get a mile next year. I told someone three weeks ago I didn't know about the Cheveley Park, but I'm sure she'll win the Guineas. I just hope I'm right." He added: "The Breeders' Cup has been mentioned but not really discussed in any detail so we'll have to wait and see." Buick said: "She saved a bit to the end - she's high class, any horse that can do that the way she did has to be very good, especially when you are doing a bit too much in front. "Looking at her you think she'll be a filly for next year as well, she'll mature and might get a mile." Although defeat for Illuminate saw her lose her unbeaten status connections were still pleased with her courageous display. Hannon said: "I thought the race was set up for us, but she just didn't go by. "She ran a super race and travelled very well, she just got tired when she hit the rising ground." Dettori said: "Illuminate has had a break and the other one was just a bit fitter. She has run a super race. You cannot fault her. We just could not get to the winner." As for third-placed Besharah, it looks as though attentions will be turned to next year with another racecourse appearance this year seemingly unlikely. Bruce Raymond, representing connections of the William Haggas-trained runner, said: "She stayed on really well and battled on well, I was pleasantly surprise with the way she kept on. "I think she'll probably stay another furlong and that will be probably be it for the year now."